They're baaaaack. When Izzy Spellman, PI, is arrested for the fourth time in three months, she writes it off as a job hazard. She's been (obsessively) keeping surveillance on a suspicious next door neighbor, convinced he's up to no good -- even if her parents (the management at Spellman Investigations) are not. When not compiling Suspicious Behavior Reports on all her family members, Izzy has been busy attempting to apprehend the copycat vandal whose attacks on neighborhood holiday lawn tableaus perfectly and eerily matches a series of crimes from 1991-92, when Izzy was at her most rebellious and delinquent. 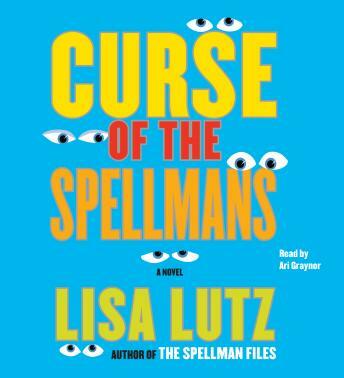 As Curse of the Spellmans unfolds, it's clear that Izzy is still very much on the case...er, cases -- her own and that of every other Spellman family member. (Re) meet the Spellmans, a family in which eavesdropping is a mandatory skill, locks are meant to be picked, past missteps are never forgotten, and blackmail is the preferred form of negotiation -- all in the name of unconditional love. Production/sound was poor. Narrator bland. The same narrator was very good in the first book. I don’t get it. Definitely was not worth a credit.